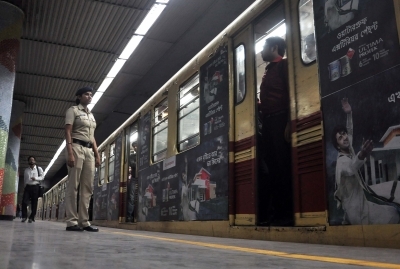 Kolkata, Feb 13 (IANS) The Kolkata Metro Railway services were partially disrupted on Wednesday after a train got stuck between Dum Dum and Belgachia stations following a power supply breakdown, an official said. The Kavi Subhas-bound metro got stuck after power supply from the third rail stopped. The passengers were evacuated, and a truncated service was being run from Kavi Subhas to Girish Park stations. Senior metro railway officials, Railway Protection Force (RPF) personnel, disaster management teams and a Kolkata police contingent were at the spot. "The incident took place as the power supply from the third rail had stopped. Since power from the third trail is required for the metro to run, the train automatically came to a stop. The passengers were evacuated," said Indrani Banerjee, Chief Public Relations Officer, Kolkata Metro Railway.